Part Two: St. Petersburg Student Makes Big Impact on His School and Tampa Bay! In the second phase of my sustainability project, The Native Classroom, we needed to remove about 2,000 Australian pines, a destructive invasive species brought to Florida from Australia in the 1890s for beauty and furniture. Ironically, the trunks are too thin and flexible for woodworking, so furniture was never made. Spreading over beaches and back lots, Australian pine roots poison the soil, preventing other plants from growing. The flimsy limbs of this species, technically a weed, cannot withstand the weight of bird nests, and the thick needles suffocate underbrush necessary for squirrels, garden snakes, and rabbits to live. On beaches, endangered birds, crocodiles and sea turtles also cannot live in these pines. It is illegal for Australian Pines to be planted or sold because they create a dead zone for habitat. Australian pines formed a wide, thick bank along an important Tampa Bay estuary on the 54th. Avenue Chanel in St. Petersburg . To benefit the environment of Shorecrest Preparatory School, a not-for-profit organization, the Edgemoor neighborhood to the north and the Placido Bayou neighborhood to the east, I organized a variety of fundraisers, complemented by a grant from The Sustany® Foundation. I raised $17,000, and it was used for the project’s materials, tools, and native Florida plants. Removing the pines required the use of adults donating their time to chainsaw trunks and then, with adults and students, pulling the tall pines down using ropes. Jeff Till Landscape Services was a major participant to this entire project. The time and effort the company put into this project was a huge help. 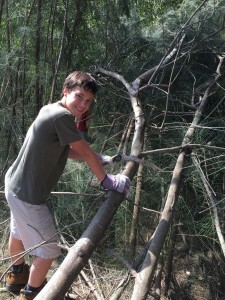 The pines were hauled by volunteers (including several volunteers from The Sustany® Foundation! ), boy scouts, and students. 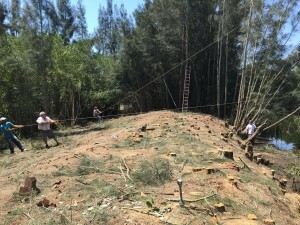 The pines were pulled by hand down a long dirt path and across the school’s track to a chipper located 70 yards from the worksite. An adult volunteer put the pines into the chipper, and at the end of two days, we produced 100,000 pounds of mulch! This mulch has to be incinerated by the city, and it cannot be used for anything else. to level the land where the dirt was located.